I'm notorious for sweeping the fridge of all remaining produce these days (ah, thank you very much, said Elvis-style), which is why I've made a ridiculously easy pasta sauce the past two Sunday's in a row…using said produce. 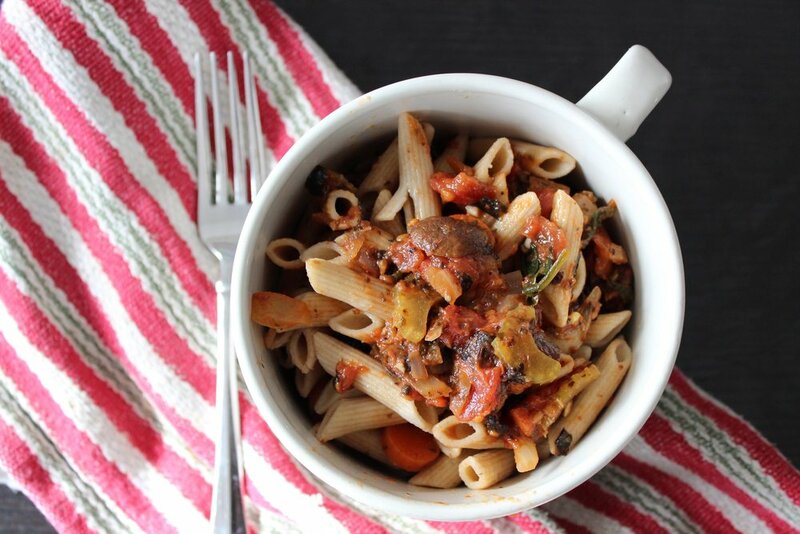 All you need are a few tomato sauce-worthy ingredients, and then a random assortment of leftover veggies (think: carrots, celery, mushrooms, and spinach). Are ya ready for the magic to happen?! In a medium saucepan over medium-high heat add olive oil and onions, and cook for 3-4 minutes (until translucent). Next, add in garlic and cook for another 1-2 mins. Scoop in canned tomatoes being careful to not add the liquid (save some for the end, if needed). Break down into pieces with wooden spoon. Add in tomato paste, wine, basil, and chili flakes. Bring to a boil, reduce then let simmer for 10-15 mins. Add in nori if this is an option for you (gives the sauce a salty/fishy measure), and your sautéed veggies. If sauce is not thick enough, then add in some of the remaining liquid from the canned tomatoes. So good, that Nia couldn't wait. The reason I'm resorting to cleaning out my fridge to make pasta instead of just going to the grocery store to get new groceries is because winter IS NEVER ENDING. What really put me over the edge was the fact that I had to commute to school yesterday (other than that, I've been fortunate to not have to leave the house much). I take back roads to school and the main one I'm on for a while actually had an emergency closed sign on it in the opposite direction. (And why it made sense that my drive was so crappy.) I love driving in snowdrifts and in temps that are so cold that the snow can't even be removed from the road, just flattened out, so instead of driving on black pavement, you're on compressed snow. You southerners are missing out. So please sympathize with me, I just need to whine for about 200 more words. Here goes: I can't cope with winter anymore; especially with these very low temps. I need warmth and non-icy roads. I would also like the snow to melt away and never return. The-end. If I can just make it a few more weeks, I think there's a good chance that we'll go back to Florida for my week off school. To all my other fellow friends enduring the cold alongside me, stay warm. Very warm.